The more the Islamic State carries out its secret subversion in the Palestinian street, the more Hamas tends to adopt the Caliphate’s terror methods. In October 2014 Palestinian security forces arrested dozens of Islamic State supporters, some of whom had tried to set up secret cells and carry out terror attacks. The Islamic State-inspired vehicular and stabbing attacks won widespread Palestinian support. Hamas does not openly back the Islamic Caliphate. Neither Hamas nor Islamic Jihad, which are both dependent on Iran as a strategic ally, are free to express direct or indirect support for the Islamic State, the cardinal enemy of the regime in Tehran. Hamas feels confident that Israel will refrain from attacking Hamas targets in Gaza due to the ceasefire. The State of the Islamic Caliphate (known as the Islamic State, IS, ISIS, ISIL, or Daesh), which was declared by self-appointed caliph Abu Bakr al-Baghdadi, has fundamentally altered the reality of the Middle East and threatens to reshuffle the geopolitical cards, change the map of existing state borders, and undermine all the Muslim states as separate national entities. The goal to re-establish the caliphate led to the emergence of the global Muslim Brotherhood movement in Egypt at the end of the 1920s; of Hizb ut-Tahrir in the 1950s, whose ideological platform enshrines the vision of the caliphate and the aim of fulfilling it; and of other Islamic organizations. All of these without exception, including Hamas (the branch of the Muslim Brotherhood in “Palestine”) and the Islamic Movement in Israel, view the creation of the caliphate as a religious duty. In line with the prophecy of Muhammad the restoration of the caliphate is supposed to be the means to unify Muslims under the rule of Islamic law (shari’a), before proceeding to conquer Europe and impose the Muslim religion worldwide. The Islamic State poses a weighty challenge to other regional actors. Not only is the vision of Islam being realized in Iraq and Syria, to which Islamic tradition assigns a special importance on the way to restoring Islam to its former glory, but the Islamic State continues to entrench its rule, fearlessly defying the United States and the West while attracting thousands of Muslims from all over the world and inspiring many millions more. The leading Islamic organizations – the International Union of Muslim Scholars headed by Sheikh Yusuf al-Qaradawi, the Muslim Brotherhood, and Hizb ut-Tahrir – have rejected Caliph Baghdadi’s call to all Muslims to swear him their allegiance. In their view, the establishment of the caliphate did not meet the conditions Islam stipulated and hence is not valid. At the same time, these groups resolutely deny the legitimacy of the war being waged by the United States and the international and Arab coalition against the Islamic State. Implicit in the ambivalence of these organizations’ posture is the baffling challenge that the caliphate poses for them. On the one hand, they do not want to swear allegiance to the caliph, since that requires total subjugation to the rule of the caliphate with all this entails; on the other hand, they want to defend the caliphate against the international and Arab coalition even though they know that the continued strengthening of the caliphate could lead to the downfall of the existing regimes and the annexation of additional states under Baghdadi’s rule. Another very important consideration for these organizations is that the Islamic Caliphate exerts great influence beyond the borders of Syria and Iraq. 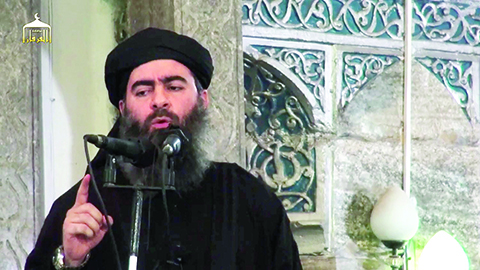 In his speech proclaiming the caliphate, Baghdadi did not request the Islamic organizations’ backing. As caliph he sees himself as representing all Muslims in the world, and he calls on them directly to swear allegiance to him and embark on jihad. Baghdadi thereby exerts influence over the other Islamic organizations; he seeks recruits for the army of the caliphate and hopes to create branches within the Muslim states that will work to overthrow existing governments. The Islamic State also exercises considerable influence in the Palestinian Authority of the West Bank and in Gaza, which is effectively under Hamas rule. When, on September 21, 2014, the caliphate’s spokesman Sheikh Abu Muhammad al-Adnani called on Muslims worldwide to engage in jihad against the infidels and kill them indiscriminately in any manner, including ramming them with cars and stabbing them with knives, the words resonated in the Palestinian camp. Over the past two months there have been many stabbing and vehicular attacks in sovereign Israel and in the West Bank; the most severe was the massacre in a Jerusalem synagogue on November 18, 2014, in which four rabbis and a policeman were murdered with pistols, meat cleavers, and knives. That the caliphate’s power of attraction has not gone unnoticed by senior Hamas figures is apparent in articles in Hamas’s daily mouthpiece Felesteen (felesteen.ps), published in Gaza. Dr. Yusuf Rizaka, who was minister for holy places in the Hamas government headed by Ismail Haniyeh and from 2007 to 2014 served as an adviser to Haniyeh, praises the “private jihad” that has swept the younger generation in Jerusalem, and explains that certain religious commandments apply to every Muslim and that parental approval is not required to perform them. Your words about the Islamic State do not interest me, since what interests me is greater than any organization, party, or ideological platform, and that is Al-Aqsa [Mosque], O the nation of Muhammad beckons to you and calls on you to put it at the top of your order of priorities, not in words and not in idle chatter, but in armies and planes. Today there is great readiness among Muslim young people to join other Islamic organizations such as Al-Nusra and the Islamic State, based on the prophecy and the many hadiths of the Prophet on the virtues of control of the Levant, the jihad warriors of the Levant and the martyrs of the Levant, and also the saying that the Al-Quds [Jerusalem] liberation army went forth from the Levant toward Jordan…. In light of the political-security reality in Gaza, which necessitated a temporary ceasefire with Israel after the war, and also in the West Bank, on the Jordanian border, and in Lebanon, Syria, and Egypt, what is required is “the ongoing adjustment of the compass of the umma [Islamic nation] and its jihadist activity in the direction of Al-Quds and the liberation of Palestine.” Here, Afana finds an effective answer to Islamic State’s focus on Iraq and Syria, which in his view detracts from the struggle over Palestine. 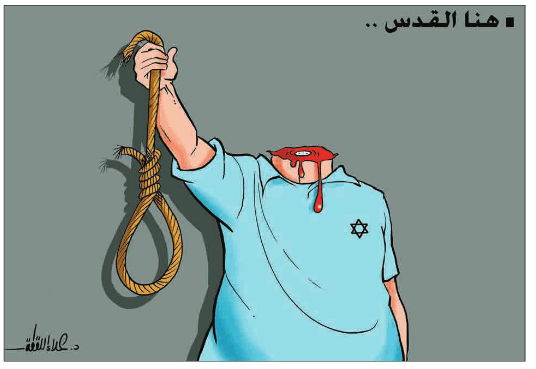 The day after the massacre, Felesteen published a cartoon showing the headless corpse of a young Jew under the caption: “Here is Al-Quds [Jerusalem].”14 Cartoons in a similar vein, lauding the stabbing and car-ramming attacks, appeared on social networks of the different Palestinian organizations. This was a continuation of the “Daes” campaign – a play on the Arabic word daes (trample) and the Arabic acronym for Islamic State, Daesh. This “Run over the Jew” theme has also been expressed in songs and videos that extol the Palestinian murderers. After that the masked Palestinian is shown attacking an Israeli soldier from behind and stabbing him to death. The soldier’s corpse is left lying on the ground in a large pool of blood. Here Mashal exercised great caution not to directly criticize the Islamic State. He did not mention it at all but instead explained the approach of Hamas, indicating that its strategy leads to achievements without sacrificing its ideological platform. Hamas is committed at present to the temporary ceasefire in Gaza. But this period of reduced terror from Gaza, even as preparations for the next round proceed, has left a vacuum. The Islamic State has entered this vacuum in a jihadist surge as it achieves victories on the battlefield, fights the West without trepidation, enforces Islamic law, and promises to liberate Palestine after overthrowing the “treasonous” Arab regimes in Saudi Arabia and Jordan. In the face of this challenge, which threatens to erode Hamas’s popular support and has already led Hamas operatives to leave the organization for the Islamic State, Hamas is trying to open a front with Israel in the West Bank and Jerusalem or at least ride the wave of “private jihad” that has swept away many. This approach is consistent with Hamas’ strategic aim of dismantling the Palestinian Authority’s rule in the West Bank, taking over the Palestinian government, and making the West Bank a base for the next terror assault on Israel – to be waged from a position vastly superior to Gaza. Thus Hamas has adopted the Islamic State’s terror methods without crediting the source of the inspiration. The more the tacit competition with the Islamic State over the Palestinian street intensifies, the more Hamas is likely to escalate these methods. In doing so, while also making repeated proclamations of a third Intifada, Hamas wants to be seen as persisting in the jihad against Israel, and it feels confident that because of the ceasefire Israel will refrain from attacking Hamas targets in Gaza in response to terror attacks in the West Bank, or to attacks that originate in the West Bank but occur in Israeli territory.